NZ’s one-person one-vote democracy is under dire threat. Having failed to force a racist constitution on us, the shadowy forces of apartheid are using another tactic: racist representation by stealth, at Council and regional levels. Tauranga, New Plymouth, the Far North, greater Wellington, Hawke’s Bay and Rotorua are all areas were the sacrifice of democracy rites are happening or were tried. Although there are regional variations, “Amalgamation” (or “Re-organisation”) – usually touted as a cure for all regional economic ills – is the devious cover for all manner of race-based Boards and Committees, some or all the members of which are unaccountable-to-ratepayer, part-Maori appointees. It’s a great example of how the racist networking scheme works. The dark knight in this racist game – Basil Morrison – chair of the Local Government Commission – is a major driver of all these racist Amalgamation schemes. He was also instrumental in forcing the aitch into Wanganui and Maori names for the North Island and South Island, when he was on the Geographic Board. And – surprise, surprise – he’s a member of the Waitangi Tribunal. That wouldn’t mean he’s been ‘leant on’ or biased, of course. Yeah, right!! In some Amalgamation proposals, it’s obvious from the name, just what’s going on. E.g. 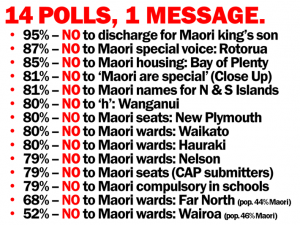 “Maori Board,” or “Te Upoko Taiao – Natural Resources Management Committee,” or “Maori Advisory Committee on Resource Management.” Others are more deceptive, such as “Regional Planning Committee,” and “Natural Resources Board.” But they all have one thing in common – race-based appointees who are not democratically accountable to all ratepayers. Such ‘Boards’ would be quite able to do the same as happened in Auckland: E.g. force expensive and racist Cultural Impact Assessments on ratepayers applying for (say) a Resource Consent to build their home. Rotorua deserves a mention in despatches as a specially smelly case. There, the mayor has shoe-horned in a form of not-accountable-to-ratepayers part-Maori appointees to a number of Council committees in a very devious and underhand way. One that ratepayers can’t vote or petition on to overturn, as happened in New Plymouth. And said Rotorua Mayor’s partner is a part-Maori! Conflict of interest – much? 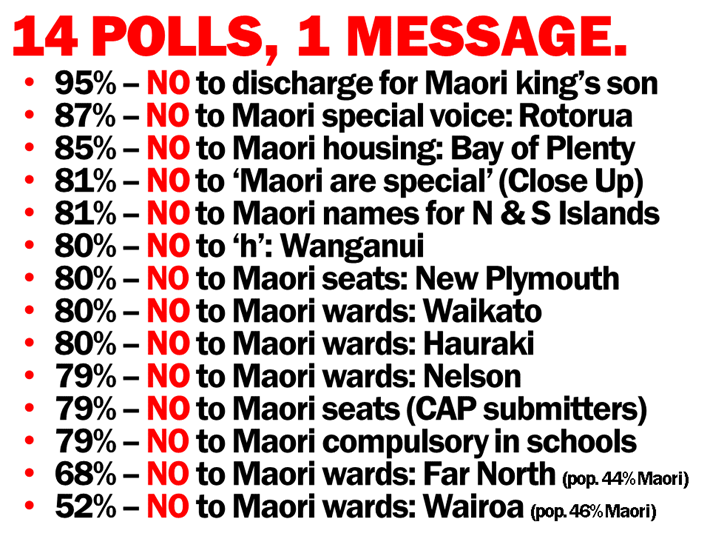 Will Rotorua voters remember that at the next local body elections? 1Law4All hopes so!